Click here for a preview of ANC027. Raven / flew / flew / flew / a black tear / in the stuff / of sky. Crossing the Bering Strait along with the first wave of old world humans, the raven assuredly brought already considerable mythological baggage along for the flight. In the centuries to follow, this mysteriously intelligent corvid's place in Pacific Northwest folklore solidified as indigenous peoples settled their communities and worldviews. In variations of tales told from Rome to Iran and Wales to Bhutan, raven became both creator of the world and unfailing trickster. For its role in such daring feats, the bird was associated with prophecy, a reputation that has lasted to present times. But what happens when the bringer of ill omens perceives a portent all its own? 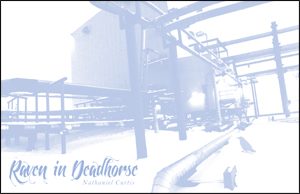 Writing from the Prudhoe Bay oil field, Nathaniel Curtis brings a distinct perspective to Raven in Deadhorse, incorporating Inuit and Scandinavian legends to allegorize the raven as witness to the startling juxtaposition of the harsh, crystalline beauty of the north with the grim grime of an industry plundering it. Captured in brief narrative poems, Curtis uses short, sparse lines to emulate the region's treeless moonscape and its shifting packs of ice. Through subzero winds and driving snow, raven calls out its dark take on the encroachment occurring in its primeval home, touching on the invasion of the European, climaxing with a tolling of doom, and ending on a note of wry hope. Raven in Deadhorse includes a collection of ten photographs originally taken by the author and manipulated to emphasize the striking planar geometry present in the surprisingly harmonious merging of tundra and steel. As this work makes clear, not all is necessarily dissonant in the clash of cultures modern and ancient. ANC027 is out of print.